The Gustav Killian Centenary Medal was originally designed in 1997 to celebrate the 100 year anniversary of the first bronchoscopy performed by Gustav Killian, German laryngologist and noted founder of bronchology. The Killian Medal recognizes accomplished senior bronchologists whose career achievements and clinical practices have made a significant impact on the art and science of bronchology. 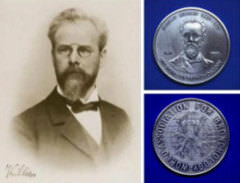 The Killian Medal is awarded only if a nominated candidate is deemed deserving of the medal, in which case the medal is awarded at the biennial World Congress for Bronchology and Interventional Pulmonology (WCBIP). Candidate must have at least one nomination from a peer or self. The nomination form may be found below. Candidate must be an accomplished bronchologist with noted track record of publications and clinical activity. Candidate must have career-long achievements consistent with Gustav Killian’s ability to help generations of patients with lung, airway and esophageal disorders. Candidate must be a member of the WABIP in good standing. Candidate must submit a completed application form (below) in addition to the following documents: a recent curriculum vitae, and one photograph of the candidate. Candidates will have their applications reviewed by the WABIP Awards committee. Candidates will be evaluated based on THREE CRITERIA (1) Importance of career publications, lectures, and technological innovations, (2) Known impact on the clinical practice and science of bronchoscopy and interventional pulmonology, and (3) Personal statement of merit and letters of support. The Killian Centenary Medal is historically the most prized award of the WABIP. The award recipient will be officially recognized in the WCBIP/WCBE program, opening ceremony, and WABIP website. Each award recipient will receive the specially engraved, centenary medal and framed award certificate. Shigeto Ikeda (1997), Jean-Francois Dumon (1998), Udaya BS Prakash (2000), Steven Lam (2002), Ko-Pen Wang (2004), Donald Zavala (2006), Pablo Diaz-Jimenez (2008), Henri Colt (2010), Hiroaki Osada (2012), Atul Mehta (2014), Kazuhiro Yasufuku (2016), Stefano Gasparini (2018). *Gustav Killian (1860-1921) was professor and chair of the department of rhinolaryngology at Freiburg University, and later in his career, professor of laryngology at the University of Berlin, Germany. The noted founder of bronchoscopy, Killian’s dedicated service helped generations of patients with lung, airway and esophageal disorders. His work inspired physicians around the world, and planted the seeds for modern day bronchology and interventional pulmonology.